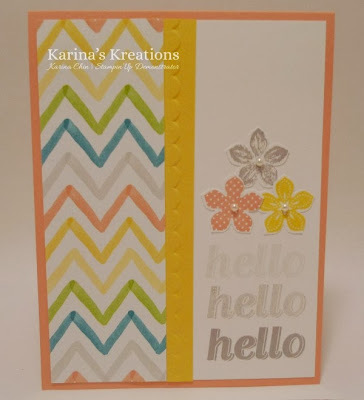 Karina's Kreations: Stampin'Up Petite Petals Sneak Peak! Stampin'Up Petite Petals Sneak Peak! We're making 20 cards at my spring sneak peak class today and this is one of the cards. It uses the new Petite Petals stamp set. I love these cute flowers and coordinating punch. You can buy yours on January 4th! I also used the new Watercolor Wonder Designer Series Paper , Scallop Textured Embossing Folder and the Simply Create stamp set. Save the Date for Sunday January 26th at 1:00! I'm holding a 20 card Birthday Card Bash Extravaganza at the Grandview Community Hall 12603-63 Ave. It's going to be a fun afternoon of stamping!